There is something immensely satisfying about heavy artillery. And batteries of heavy artillery are a staple of 40K imagery, from the horrible, grinding trench warfare at Vraks to the Iron Warriors trying to tear down the walls of the Imperial Palace. 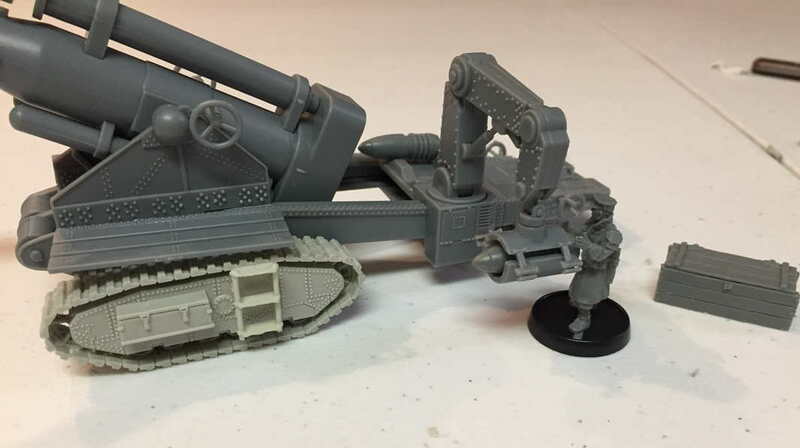 But the conventional way to build a proper artillery battery of towed guns recently has involved turning to Forge World, and at £76 ($100.42 USD at time of writing) that was a pretty expensive army to build. Which is one of the reasons I’ve speculated as to why you didn’t see more of them – it was simply too expensive. Enter Victoria Miniatures and the Sledgehammer BFG. 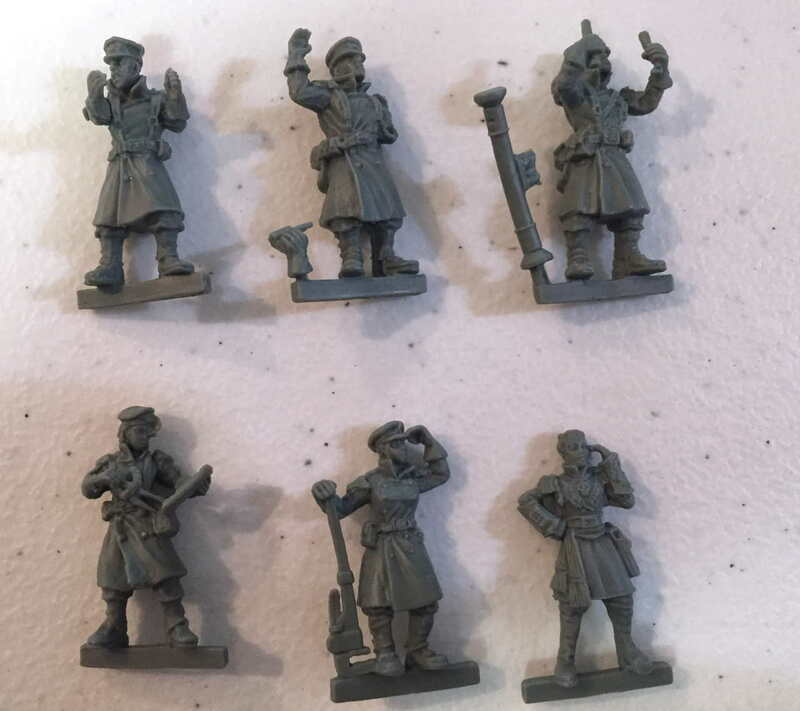 First, as always with our reviews, a disclaimer: Victoria Miniatures was kind enough to provide a review kit for us to build and evaluate. I don’t believe this has colored my view of the product, but I’ll let readers decide that for themselves. 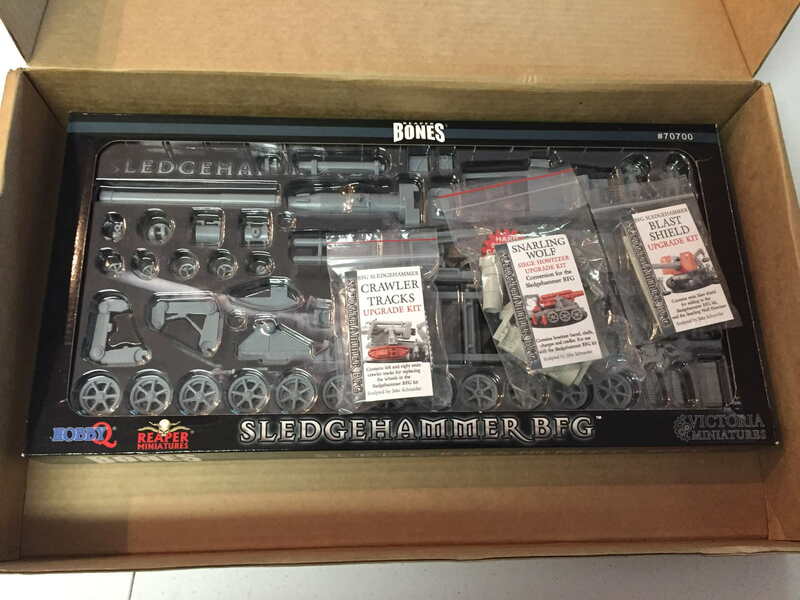 Originally a partnership as part of the Reaper Miniatures Bones III Kickstarter campaign, the Sledgehammer is officially available directly from Victoria. Coming in at $74.99 USD ($90.98 with shipping, or with free shipping for orders of $100 or more) it’s considerably cheaper than the Forge World kit to the tune of ~ $25 per kit (more if the current “Brexit Discount” goes away and the GBP:USD relationship returns to normal). In contrast to a lot of Victoria’s products, and presumably owing to the larger volumes allowed by the Bones Kickstarter, it’s also in a hard styrene plastic rather than a resin. 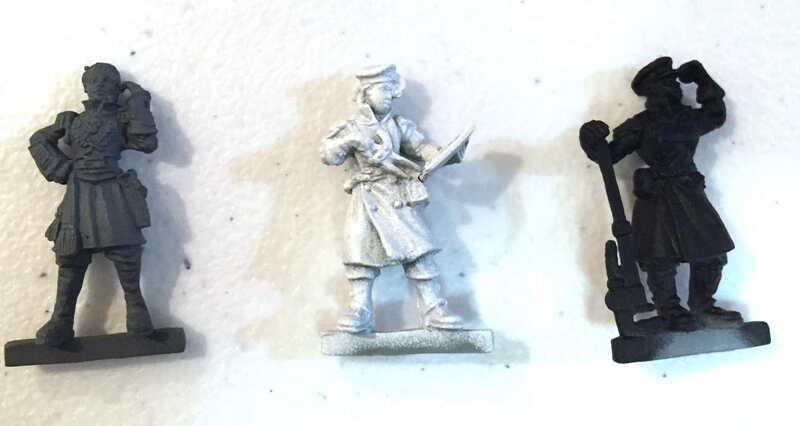 The crew are in Reaper’s semi-flexible “Bonesium” material, while Victoria offers resin versions of the crew for an extra $25 (again, cheaper than the Forge World equivalent). 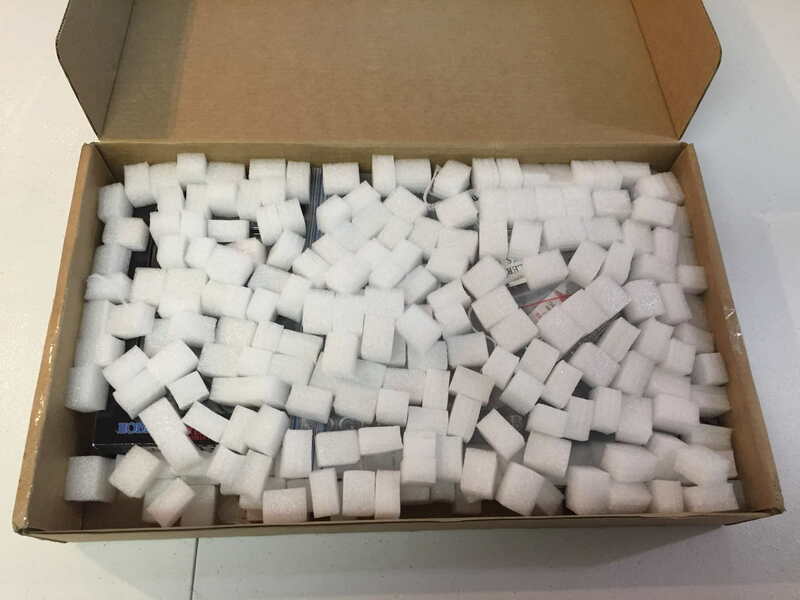 The shipment arrived from Australia and was nicely protected – shipping these things will involve pretty minimal risk of damage, owing to the unique way it’s packed (more on that later). 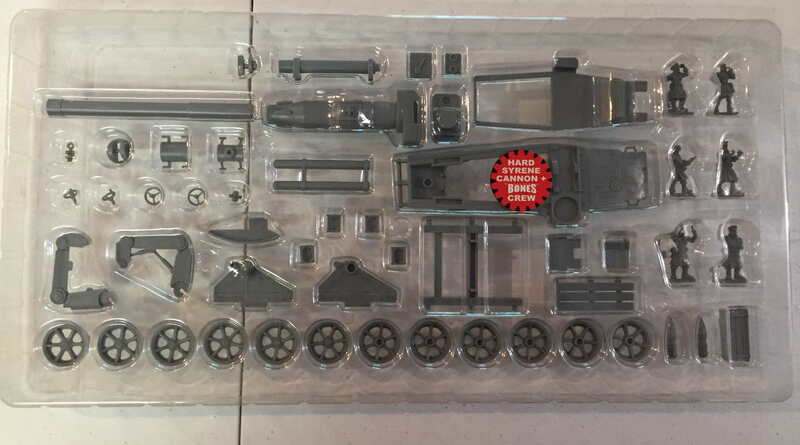 Inside was a rather nice surprise – in addition to the Sledgehammer itself, Victoria had included the add-ons available for the kit, to expand the range of customizable options. These are reviewed toward the end of this piece. The box itself is lovely – clearly branded, with some neat pictures on the back, etc. If you’re looking at giving this as a gift or the like, stuff like this is worth noting, and it does make everything feel polished. 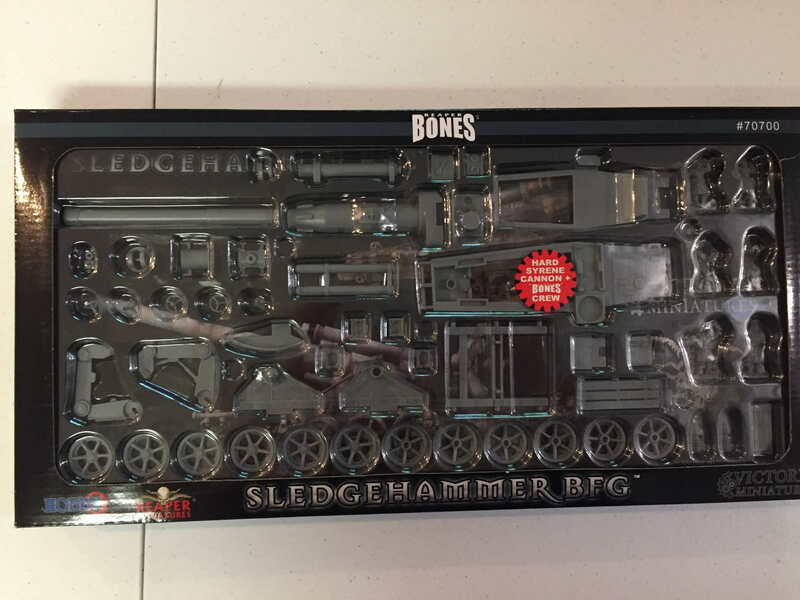 This is also where you can see the fairly unique packing system – unlike a box with plastic bags in it, ala Forge World, or everything coming on sprue, each component of the Sledgehammer is in an individual blister, and pre-trimmed. This made everything feel really secure, and was nice for keeping track of some of the smaller pieces that come in the kit. 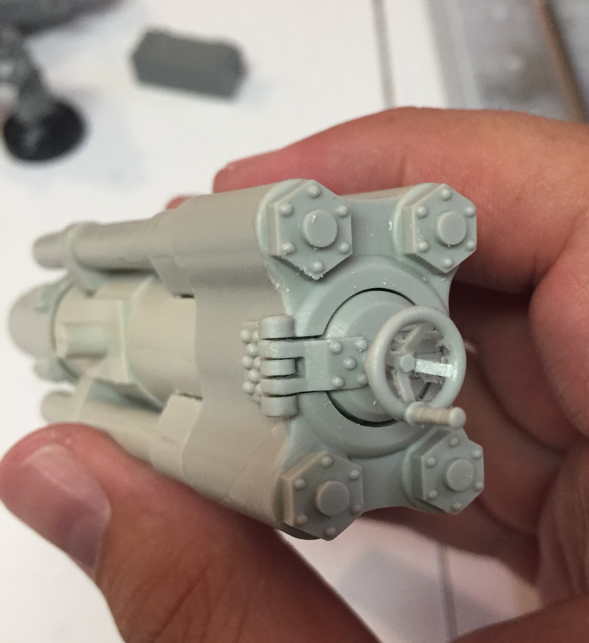 I also feel like it’s probably especially useful to keep the Bonesium crew away from mishaps while the heavier hard plastic pieces move around in more conventional shipping solutions. As for the pieces themselves, the trimming was decent but not perfect. If you’re hoping to do zero mould line scraping you’re in for a disappointment, but the prep work was minimal. I’ll be honest, I was ready to hate the crew. 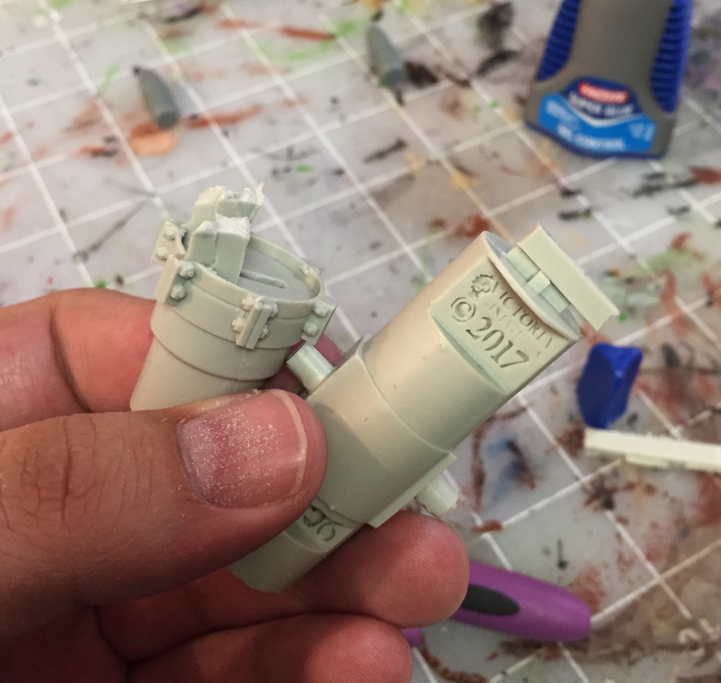 I’ve had some bad experiences with Bones products before – way, way too bendy, issues with primer that cause them to be both easy to rub the paint off of and perpetually sticky, etc. It’s to the point that I don’t actually back the Bones Kickstarters. …I don’t hate this crew. Yes, the thinnest pieces are a little more flexible than I’d like, and I think a bit of detail is lost in the softer material, but they’re certainly serviceable. 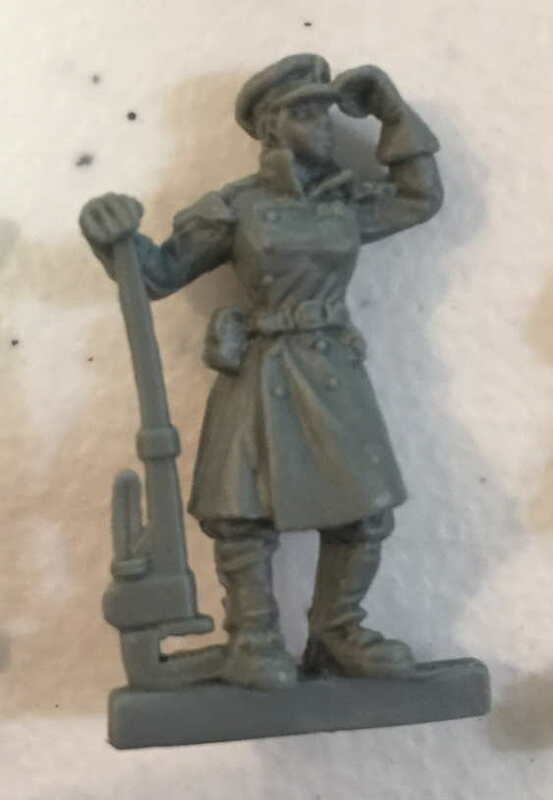 Scale-wise, they’re on-par with Victoria’s other miniatures, which means they’re roughly the size of standard 28mm human infantry, but with markedly more slender proportions than generic Cadians. They’re much more similar to the finer Forge World Elysian or Krieg models. 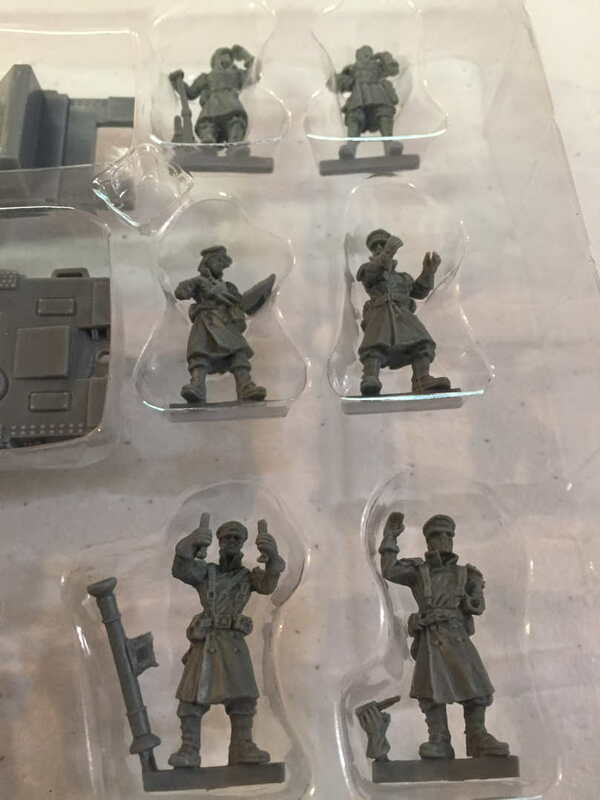 A size comparison is provided with a GW Cadian, a Victoria Arcadian Guard (reviewed here – note that the figure is on a slightly recessed base), a Sledgehammer crewman and a Mk. IV Imperial Fist Space Marine. 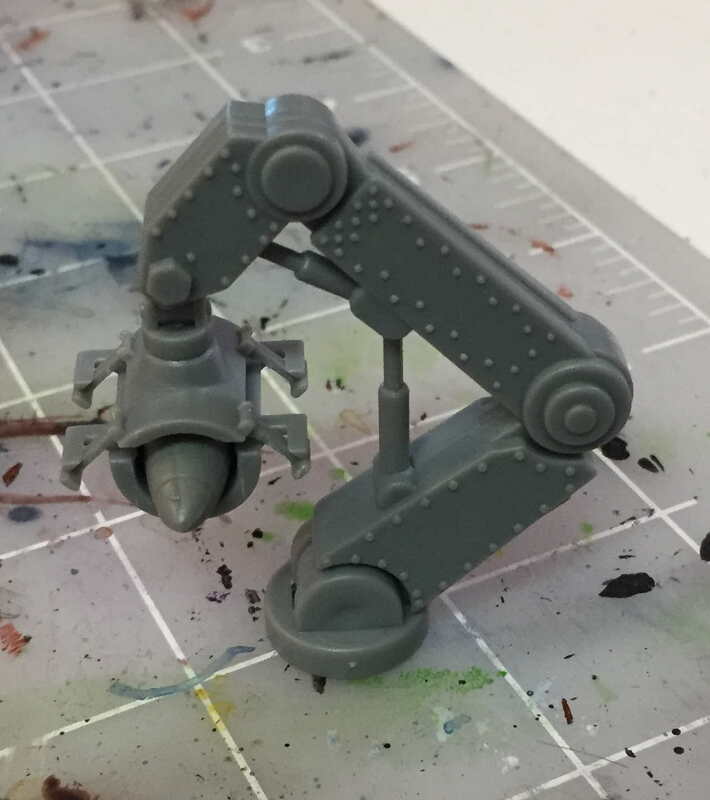 I was also concerned with how the Bonesium crew would stand up to priming – advice runs from just don’t prime them at all to not using acrylic primers and a dozen other different techniques. I picked three common primers I had on hand – a grey Krylon rattlecan primer, Vallejo Surface Primer in white shot from an airbrush, and Badger’s Stynylrez primer in black, also from an airbrush. I did no other prep work, like washing the minis etc, and gave everything ~ 24 hours to cure. I’m pleased to say that all three figures seemed to turn out fine (my quick-and-dirty priming not withstanding). They all seemed to have plenty of tooth, there was no “tacky” feeling or evidence of weird interactions between the material and the primer and/or propellant. Overall? If I was buying this as a gaming piece, I’d probably spring for the resin crew, but the Bonesium versions can do in a pinch. I’m hoping we get some more resin conversion kits or crews for some of her other regimental styles, as these all have a very distinct visual style that I think would end up looking funny alongside Arcadians or some of the other regiments. The first thing to note is that the reason you don’t see an instruction booklet in the unboxing pictures is because there isn’t one. You can however download one from Victoria’s website. The second thing? The kit is a breeze to put together. The parts are clearly marked, there’s lots of nice “keyhole” and “T” shaped connectors to make sure everything’s aligned correctly, and for the most part, things fit perfectly. My brother and I hammered it out in perhaps two hours worth of assembly work, and that was with stopping for pictures, having a spirited debate and mockup of the optional kits, priming the crew, chatting about 8th Edition, and petting my dogs. If you were looking to crash-assemble a whole army? You could get the guns done in a night. Third? Man that’s a big barrel. It’s long enough that it’s actively hard to take pictures of it. The kit comes with a nice variety of options to keep things varied, or to customize the pieces to your “feel”. If you don’t glue it, the barrel elevation can be changed. There’s shells that can be placed in the cradles on the main body, in the hoist, on the ground nearby, or in a storage box. There’s two different kinds of steps – one meant to evoke wood (though it doesn’t have a grained texture, so it could also be longer metal sheeting) and one that’s clearly metal and smaller. The crane/hoist system is very well articulated so it can be used in a number of poses – from off to the side being loaded to near the breech helping move a shell into place. That allows for a degree of customization and variety in a kit where you might be expecting to have several of them in your army. These kinds of details add to a kit where the actual details are a little sparse, but aren’t so varied as to be overwhelming. Overall, I was very happy with the mechanics of building the kit, the logic to the design, and would be more than happy to have this gun shelling the living daylights out of some heretics. None of these are necessary – the kit is just fine as it is. 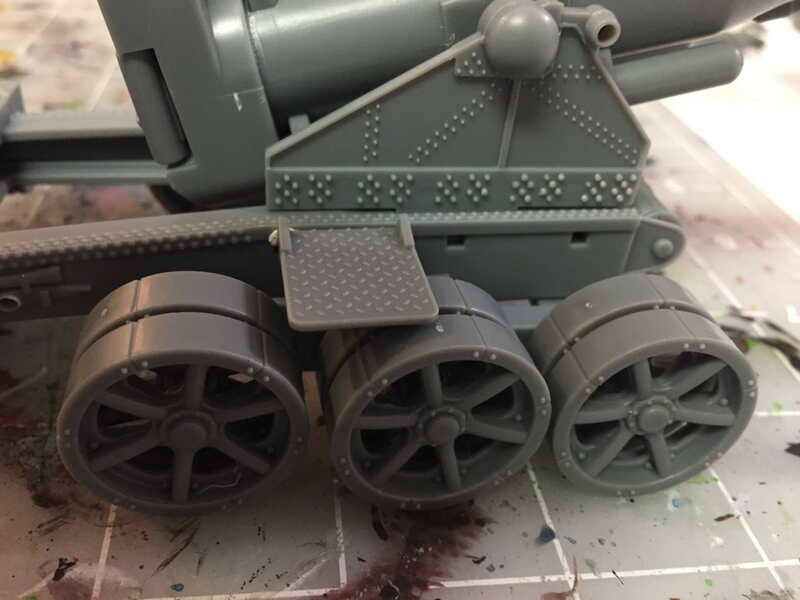 None of these accessories come with instructions either – I highly recommend you work on the main kit first, as some of them (especially the howitzer kit) only make sense once you’ve learned the “logic” of the design. Also, note that many of the pictures that follow are either dry fit or held on with blu-tac – poor fits are largely the result of that, not the kit. The blast shield is a massive sheet of fairly thin resin that protects the front of the the gun, and is supported by two braces on the carriage of the gun. It was slightly difficult to figure out how this worked from the pictures, as none show the back of the gun shield fully. Honestly? It’s not a look I go for – I’m of the opinion that these guns should look like they’re intended to be miles from the front and that if you’re trying to protect a gun towed gun from small arms fire you have failed. That being said, if you’ve got more of the heavily armored, close in, “Armageddon-pattern” aesthetic for your force, it’s a good, and pretty cheap option. And a nice, large pallet for transfers, weathering effects, and other fun customizations. At least in my opinion they look great, add some nice detail to the figure, and are by far the easiest kit to assemble – vastly easier than the wheels the Sledgehammer actually comes with. 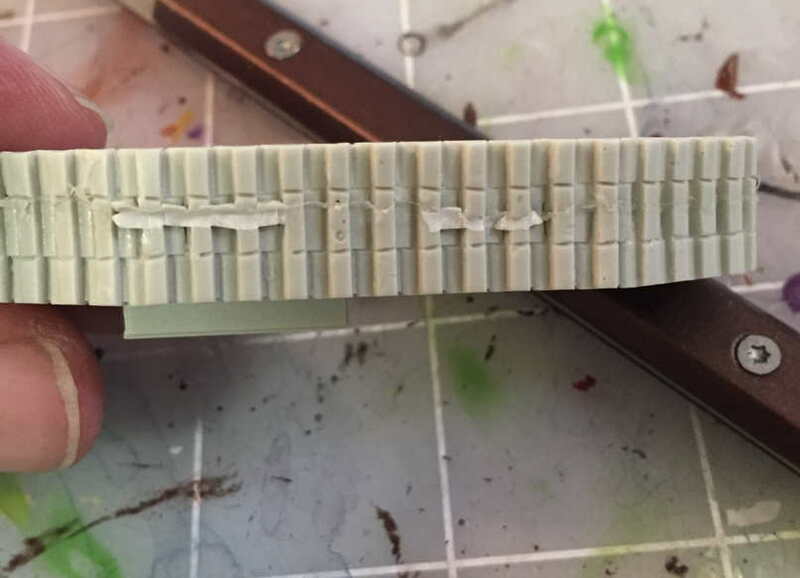 There were some minor gates and other casting issues on the kit I got, exclusively on the bottom of the tracks, difficult to see even if you didn’t bother repairing it, and easy enough to repair with a knife and file. My biggest issue with the tracks was the idea of tracked, towed artillery – I didn’t think any existed, and I was having trouble getting over practicality vs. the Rule of Cool. 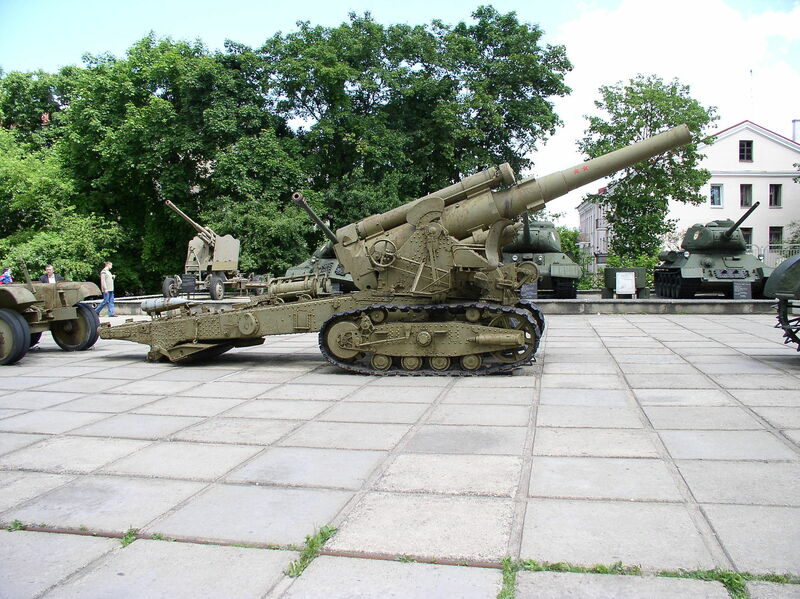 Then I found the Russian B-4 Howitzer from WWII, with a…remarkably familiar look, and abandoned such concerns entirely. 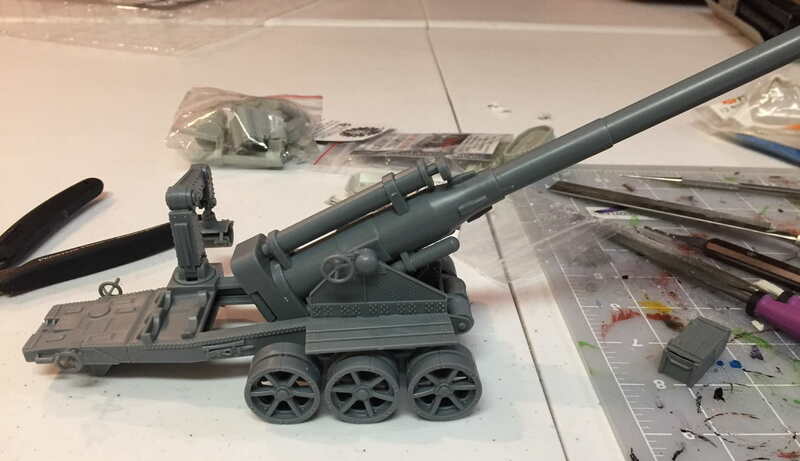 For $20, you can turn your gun into the “Howling Wolf Siege Howitzer”, which is a total breech/barrel conversion of the Sledgehammer kit. 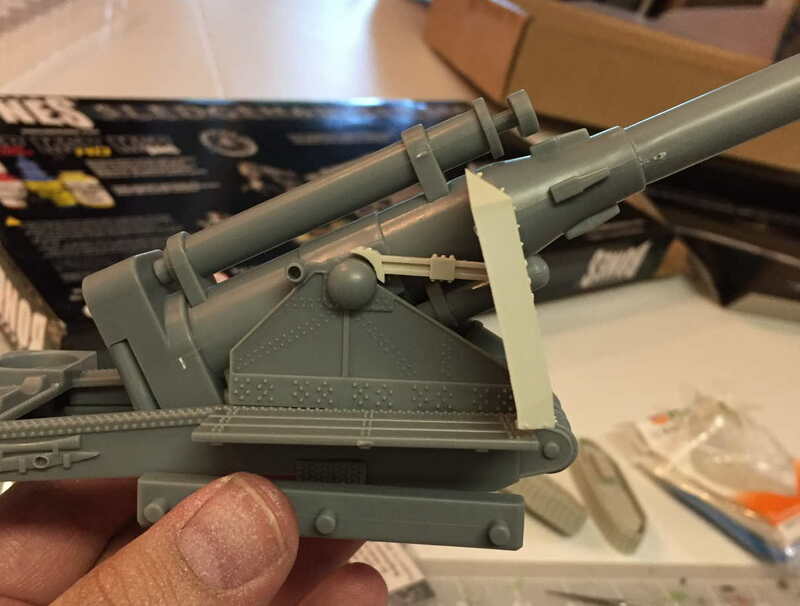 The kit has some really nice details – a different, more intricate breech and a stubby barrel with some truly enormous shells (and separate explosive charges). 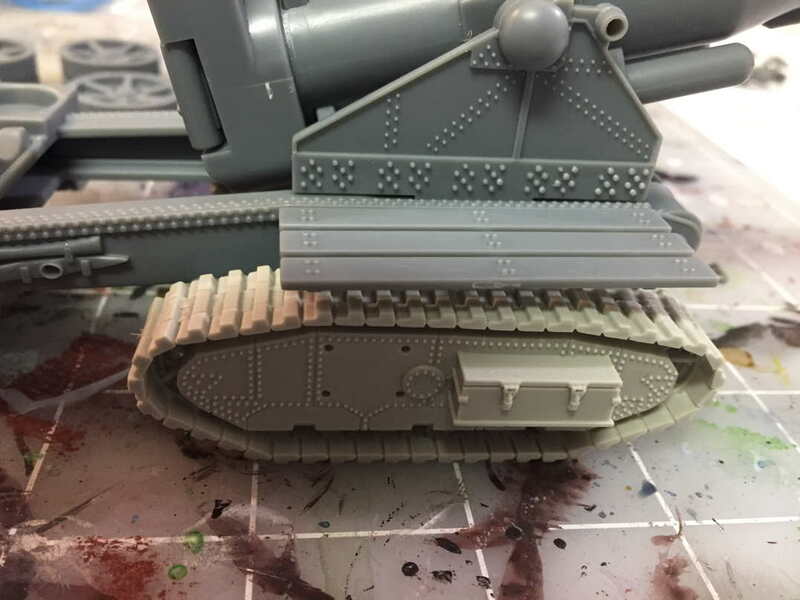 Beyond making the kit vastly easier to transport, it’s a great representation of the up-close-and-personal Medusa gun carriage from Forge World. To my mind, it’s also a good candidate for the gun shield add-on to represent some serious artillery intended for close assault. 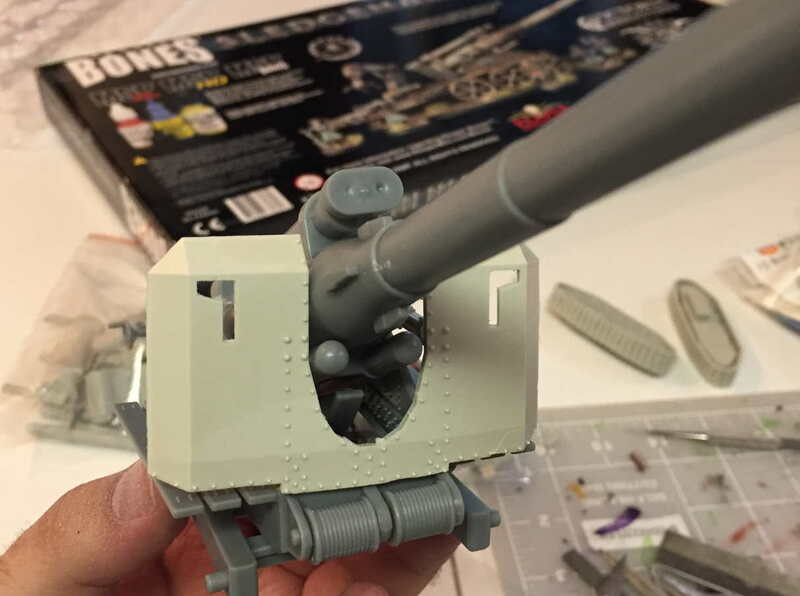 I will say that there is where I ran into some casting issues – parts not fitting quite as flawlessly, some serious gating that was hard to distinguish where the excess resin started and the little guide pieces to line everything up began, and some small bubbles. Certainly nothing fatal, or even that unusual for a resin model, but compared to the nearly tool-less assembly of the standard kit, the upgrade kit is definitely a return to the familiar land of razor saws, files, and liquid Green Stuff. 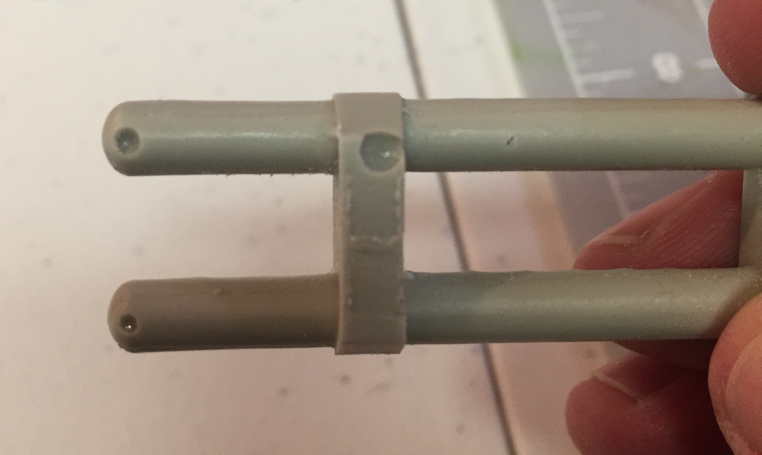 Update: I spoke to Victoria and she stated that the bubbles in the are below what she considers standard, and likely from an early casting of that piece – and that if one is a paying customer, she would replace that piece on request. I liked this kit quite a bit – it’s easy to assemble, vastly more affordable than the Forge World equivalent, and has enough possibility to make sure if you have a full battery that there’s some variety. The model itself is a little light on details, but I think this will be easy to make up with the crew itself, weathering effects, etc. to bring in real character. And there are a ton of opportunities for weathering. The add-ons are unnecessary, but nice. My favorite by far are the tracks, but I can see a place for either game reasons or aesthetics to add the other two to a kit. They are however definitely in the realm of intermediate modeling, as compared to the extremely beginner friendly main kit. Overall? I’m extremely happy with mine, and if I feel the need to build a proper artillery battery in the future, this will be my kit of choice for doing that in a way that doesn’t break the bank. The only thing I’m really hoping for is a little more variety in the crews – and on that front, I’d plan to pick up the resin crew as well as the kit itself. Overall Score: 8.5/10. The Sledgehammer BFG kit is available from Victoria Miniatures. 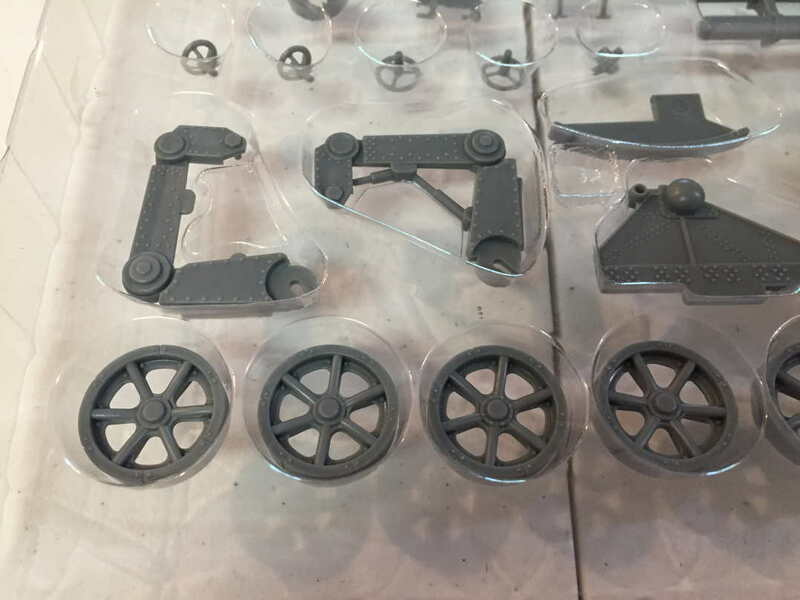 The track parts look really nice, do they have detail on the inside? I was considering using them for some light vehicle scratchbuilds. No, they don’t. The side facing “in” is just two slots to fit the track to the carriage, a copyright type imprint and blank resin. Fair enough, they look great regardless! 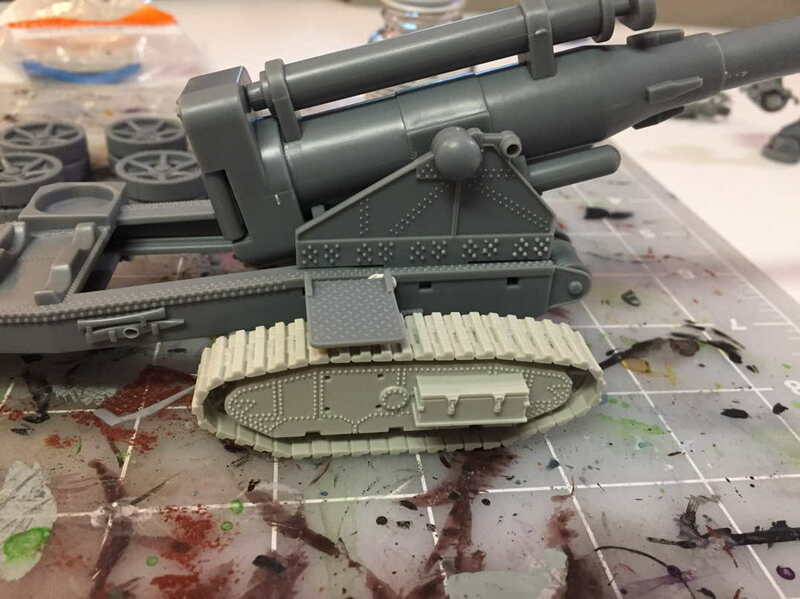 Would i be able to order the siege cannon independantly and use it in the conversion or do i need significant parts of the earthshaker gun? The gun itself is entirely separate – you get the barrel, breech, etc. If you have a separate carriage/chassis you want to mount it to, you should be set with just it. Just as a general note, the blast shield isn’t for small-arms fire. It is, as the name suggests, to protect from blast and shrapnel, in case of counter-battery fire. Enemy artillery doesn’t have to strike right on the gun to cause damage, and your mighty boom-stick isn’t going to be much use if the crew is turned into a fine, red mist. I bought the Sledgehammer during the Reaper Bones kickstarter, but I kept putting off working on it. I finally pulled it off the shelf this week. I’m looking at the instructions on their website, and I’m trying to figure out where a piece is supposed to fit into the model. I can not figure out where it’s supposed to go from any of the pictures I’m seeing online. Can you help me solve this puzzle? Thanks! Yep! The answer is it’s mislabeled in the instructions – there’s two #31 pieces in the instructions. The one that’s a small gear should be piece #36. Next Post: Will the Aliens Save Konor?